Over the years many people have been tragically electrocuted or seriously injured when they or their equipment have come into contact (or near contact) with overhead power lines. You do not have to touch a power line to suffer shock or be electrocuted. Electricity can and will jump across a gap when the voltage is high, so those involved in the use of tipper trucks, delivery trucks with truck mounted cranes, and high machinery need to exercise particular care in the vicinity of overhead lines. Anyone who comes too close to an energised overhead line is at serious risk of injury or death. Electric current will immediately flow through their body and they will suffer either electric shock, be electrocuted (killed) or suffer very bad burns. LOOK OUT, LOOK UP whenever you are involved in any activity (be it construction, farming or leisure) near overhead power lines. If you are involved in construction related activities you should be aware of and implement the safety control measures set out in the HSA Approved Code of Practice for Avoiding Danger from Overhead Electricity Lines. This Code of Practice can be downloaded from ESB Networks or from the HSA websites - http://www.esb.ie/esbnetworks/en/safety-environment/booklets.jsp. Implementing the necessary safety precautions could save life or prevent a serious injury or incident. - Never undertake any construction activity within 6 metres of an overhead power line (10 metres if the voltage of the line is greater than 38kV). - Never dump spoil, rubble or topsoil under an overhead power line. To do so would reduce the safe line to ground clearance. FALLEN (or low hanging) WIRES can be deadly dangerous. You must always assume that they are live. Keep well away from them and keep others away. 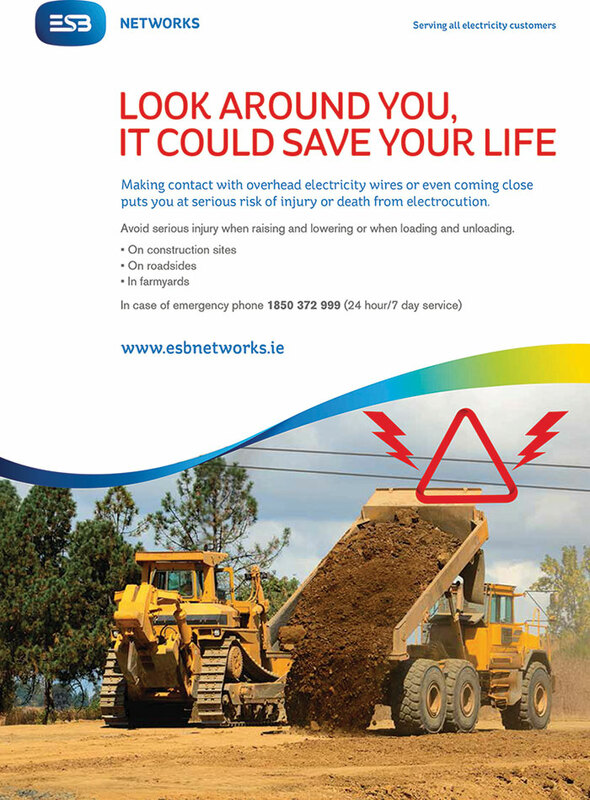 Contact ESB Networks at its 24 hour emergency number 1850 372 999 so that the situation can be made safe.